This site is archived. Contact ServiceDesk for any enquiries. Your Monash Journey begins with us today. In 2016 two friends sat down to tackle a problem. Like many students, they found the time they were taking to decode the Monash Handbook and understand their course requirements was too much time lost from studying or, you know.... other university-related activities. So they decided to start up a website that would simplify the course planning process. Now, MonPlan is run by a team of Monash students. Our team consists of various students from across the Science, Engineering and Information Technology faculties, and the project is supported by eSolutions as part of their Student First initiative. We have had several release cycles, each time updating and improving the user experience. The MonPlan team would love to say thanks to everyone who has given us feedback and support. You have made the Monash experience better, for students both now and in the future. 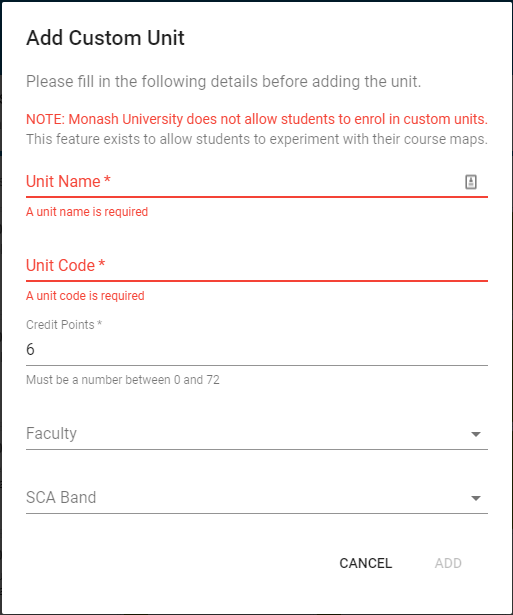 Our vision for MonPlan is for it to become a tool in which both new and current Monash students could not only use as a tool to help them plan their course, but also help students enrol in units. But also helping new students in picking a course, based off their future career. Really really really good app! Has saved me heaps of time course planning. Great new improvements with being able to load unit information and upload course maps! This is a great site, I wish I'd had it when I was first an undergrad! Here's some quick features about our web app! View information about your unit, including the description, when and where the unit will be held, Prereqs, Coreqs, how many credit points and how much the unit costs (based on 2017 costs and for Domestic CSP students). As well as SETU ratings for that unit. We have improved our validation, bringing smarter and clearer indication of where you may face problems from Course Advisors. Print, Share or Save your Course. You can share and save your course as a link, otherwise you can also print it off and take it to a course advisor, easy right?. 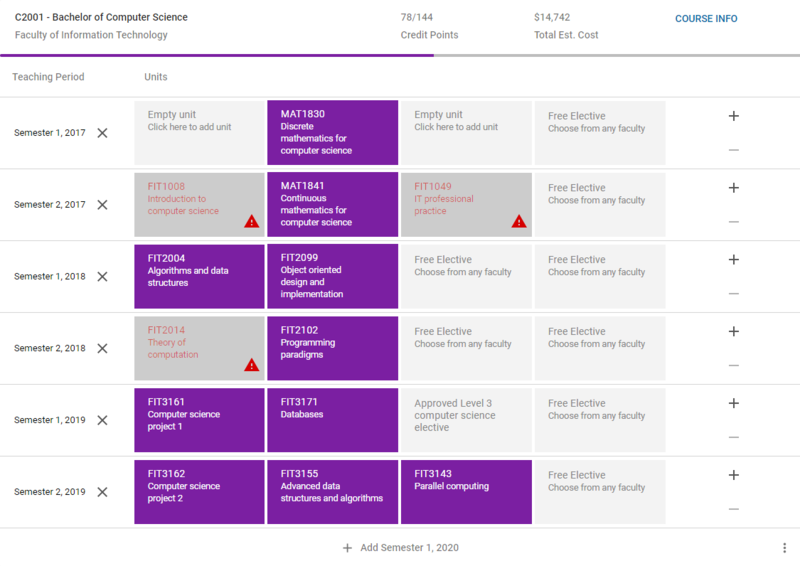 You can view information about your course such as Course Duration, required Credit points, etc.